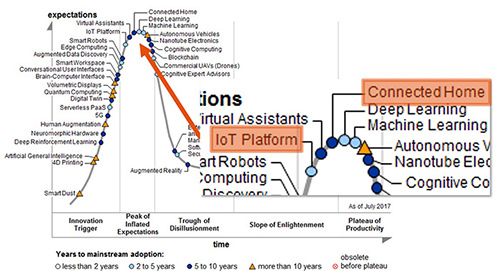 The latest Gartner Hype Cycle for Emerging Technologies shows that all IoT related items are at the top of the curve. Usually, the next phase is the Trough of Disillusionment, which in practice means that playing time is over. IoT related companies will need to evolve and mature very quickly. These businesses will face several challenges before reaching that level of maturity. The most important challenge is to overcome the discrepancy between the one-time revenue of the sale of a device and the recurring costs of keeping those devices connected. Additionally, growing cyber threats related to firmware vulnerabilities and strengthening regulation holding hardware manufacturers increasingly liable for damages incurred by failing IoT devices will have an upward pressure on those costs. A promising strategy that manufacturers of connected devices can follow to close the cost-benefit gap is to focus on service delivery based on a recurring revenue model, in which the hardware is only a derivative to deliver the service instead of being the central part of the proposition. A recurring service fee makes covering costs for connectivity and secure firmware much easier than a one-time purchase revenue. Cost efficiency will be an important driver in ensuring a sustainable business model. As public cloud services mature and offer more and more services tailored to connected devices, IoT service providers should primarily focus on automation. This includes automation of continuous integration of the cloud based software, self-healing and auto-scaling server based software and also automation of full life-cycle management of devices, with firmware updates. A recent development in cloud based service offerings that can further drive down costs is serverless computing, such as AWS's Lambda and Azure Functions. They are extremely efficient in handling infrequent requests from devices while not requiring any exclusively reserved infrastructure. As an example, the break-even point for the cost of a typical EC2 instance (m4large) to handle requests taking 200ms and requiring 500MB of RAM is over 17 requests per second compared to the costs of handling same requests by AWS Lambda. That is: 17 requests per second for 24 hours per day, 7 days a week. Serverless computing fills-in the promise of 'pay for what you use' instead of 'what you need'. As hardware development progresses, an increasing amount of computing power is also available on devices themselves. For mains powered devices, where power consumption is much less of an issue than for battery operated ones, a fair share of that power goes wasted while devices remain idle. IoT companies can leverage on this untapped potential by offloading workloads partially back into those devices. 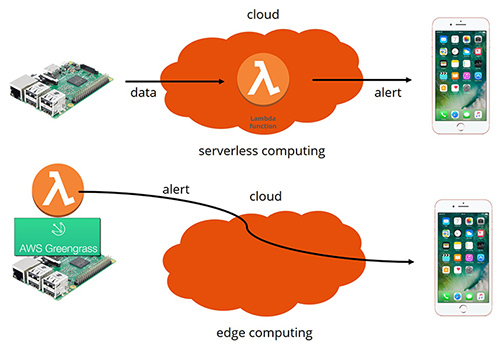 So-called fog or edge computing services allow functions deployed in their serverless computing services to run unmodified on compatible devices. Amazon offers AWS Greengrass that allows synchronisation and local execution of Lambda functions. Microsoft too has a comparable service called Azure IoT Edge. When it comes to recurring services, another important general trend that IoT will not escape from is the increasing use of artificial intelligence to deliver services that were out of reach until very recent. Major advances in natural language processing and image recognition show the vast potential of machine learning and deep learning algorithms. For IoT based services, the ability to detect complex patterns and to predict future behaviour will have a profound impact on the market. I personally believe that turning a blind eye to these technologies is something no IoT service provider can afford to do. 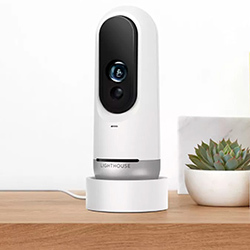 Recent introduction of the Lighthouse security camera is a nice example of AI’s added benefits. Lighthouse uses a combination of voice control and advanced image processing to easily enable alerts such as 'notify me when my son is waving at the camera when he gets home from school'. Drawing the parallel between the evolution of serverless computing towards edge computing, I see a similar development in AI-based services, where tech giants like Apple, Google, but also Huawei are now introducing hardware tailored for AI based processing in home assistants and mobile phones. In a few years, a connected doorbell will be fully autonomously capable of opening the front door for familiar faces while your smart lighting automatically adapts to changing conditions and habits. The world is very likely to witness a couple more attacks on and from large numbers of connected devices that, in hindsight, will make the Mirai botnet look like a small glitch. Advances in hardware development and AI based software innovation will drive the connected device industry towards whole new levels, and we better be prepared. The IoT revolution may not be ‘well on its way’ just yet, but it has already begun. Will you help us improve Toon?